Bl. Margaret Castello (1287–1320) was born to noble Italian parents who were awaiting the birth of the child of their dreams. Instead, they bore a daughter who was blind, dwarfed, lame, and hunchbacked. Margaret’s parents were horrified by the physical appearance of their newborn child, so they hid her and kept her existence secret. A servant had her baptized and named her Margaret, meaning, “Pearl.” When she was six years of age she was nearly discovered, so that her father confined her to a cell inside the wall of a church with her necessities given through a window. The parish priest took it upon himself to educate Margaret. She lived in this way until age sixteen, when her parents took her on pilgrimage to a shrine famous for miraculous healings. There they prayed earnestly for their daughter to be cured of her deformities, which they loathed. When no cure came, her parents abandoned her in the streets and returned home, never to see her again. Margaret begged for food and was helped by the town’s poor who took turns sheltering her in their homes. She became a Dominican Tertiary and took up the work of serving the sick, dying, and imprisoned. Margaret was known for her great joy, sanctity, and profound mystical experiences. 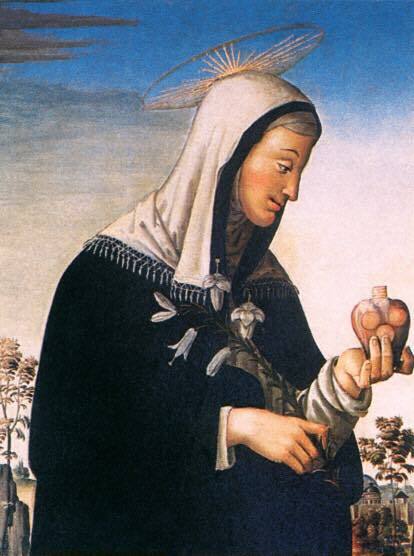 She died at the age of 33, and hundreds of miracles were credited to her intercession both before and after her death. Her body is incorrupt. She is the patron against poverty, and of the disabled, handicapped, and unwanted.